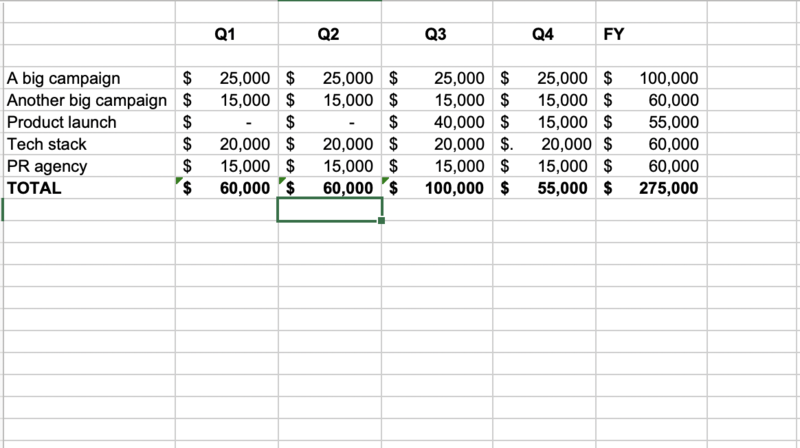 Until we achieve our master plan of making Plannuh the primary tool for building and managing marketing budgets, most marketers will continue to use Excel to build their budgets. And while Excel is a fantastic tool, it is surprisingly common for marketing budgets built with Excel to include expensive mistakes. As part of our customer on-boarding process, the Plannuh team takes existing Excel budgets and imports the data into Plannuh. In that process, we have found that the majority of marketing budgets built in Excel contain errors. In almost every case, the errors result in underestimated marketing costs. In some cases, those errors can add up to hundreds of thousands of dollars in a single budget. What is driving all these errors? As marketing budgets get more complex, the likelihood of errors increase. And in many cases, spreadsheets are used year after year, with many edits and consolidations that can also introduce errors. When marketing teams get larger, they often distribute the responsibility of building out their budgets by sending templates to their teams. Those teams edit the templates, consolidate the data and email the worksheets back to a single point of integration. In that integration, errors often occur. 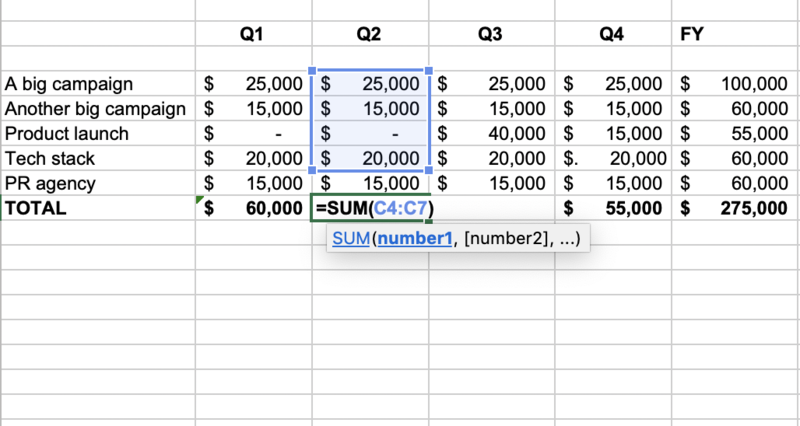 By far, the most common error occurs when SUM functions are incorrect because a row is added to the spreadsheet without adjusting the formula. The example below shows this error, where the PR Agency line was added after the fact without adjusting the formula. 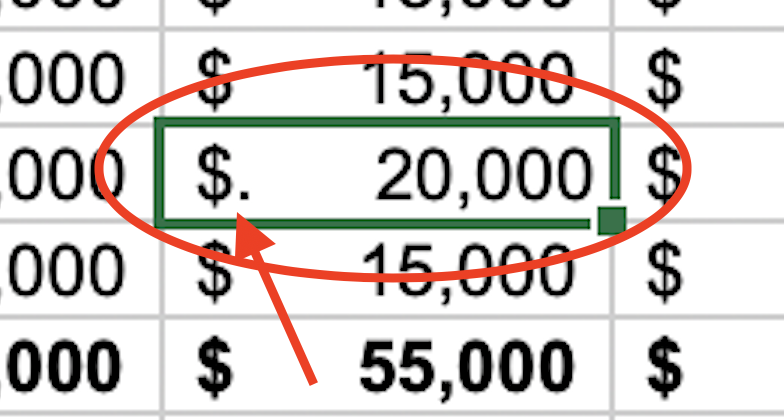 Excel actually gives you a hint as shown by the green corner highlights in the cell. When you click on the cell and select the warning sign, you see the full text of the error as in the image below. 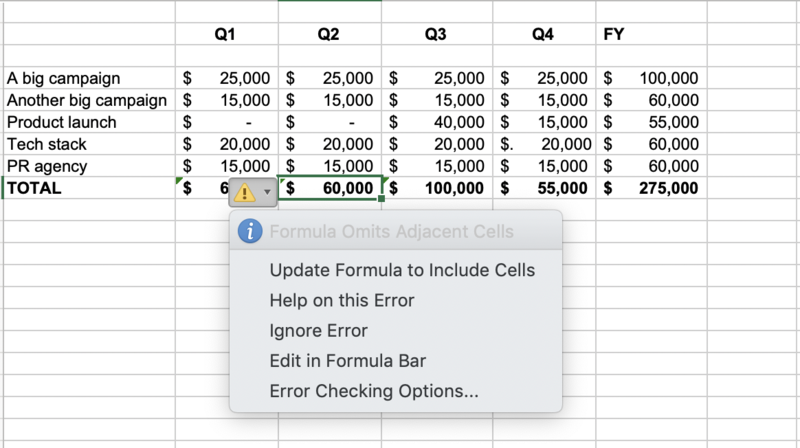 The error tells you the "Formula Omits Adjacent Cells. And when you double-click on the cell, Excel will highlight the formula range as show in the image below. To correct this formula, you can either drag the range to include the last row, or edit the formula directly to change the range from "C4:C7" to "C4:C8". Also, make sure that you correct all instances of the mistake. You can also use the "Error Checking" function in the "Formulas" ribbon of Excel to highlight all relevant errors. This type of error is surprisingly common as your team takes numbers from word processing documents, PDF files, or presentations and pastes them into a spreadsheet. We see this kind of error many times a month when helping set up customers with Plannuh. These numbers as text errors can be really tricky to spot, especially if you are doing a large consolidation of data. How do you completely eradicate these errors? Systems like Plannuh have built-in calculation logic and error checking to reduce this kind of error. If you have questions about your budget, or just want to check to see if you have errors, set up a Plannuh account and one of our marketing experts can review your budget and give you a free budget report card.